LG G6 vs. Galaxy S8 vs. Xperia XZ Premium. It’s pick-a-flagship time and these are probably the three best phones of the season. The Samsung Galaxy S8 and the LG G6 are already available worldwide, while the Xperia XZ Premium is just about starting to hit the shelves – so it won’t be all that painful a wait if the phone proves worthy. The HTC U 11 would’ve felt right at home here too, but it was only announced a day or so ago and we’ve barely gotten a glimpse of it. As if these 3 massive egos aren’t too hard to handle already. Anyway, the HTC U 11 will have a chance to prove its worth, that’s for sure. The Xperia XZ Premium enters this fight with the fastest smartphone camera in existence – it can record videos at up to 960 frames per second (not even an entire second, but more on that later). 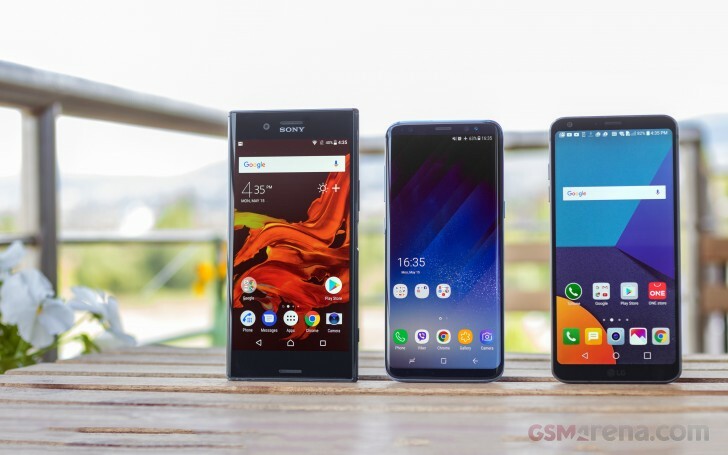 It’s also got the highest-res display of them all – Sony was the first to take the plunge into 4K with the Z5 Premium and, a year and a half later, the XZ Premium is only the second phone that goes beyond QHD. Okay not entirely true – both the G6 and S8 pack a few more pixels than the standard 2,560×1,440px, but on the tall side only. The G6’s 18:9 aspect (a.k.a. 2:1) means 2,880×1,440px, while the S8’s even weirder 18.5:9 ratio (or 37:18, while we’re at it) results in 2,960×1,440px. Such are the times. In terms of hardware, the LG G6 comes slightly disadvantaged – it’s powered by the Snapdragon 821 chipset, as opposed to the 835 in both the S8 and the Premium. LG paid the price for the early launch but it’s true too that the G6 won’t burn up your budget like the other two. It’s not just in this way that the G6 stands out, however. LG’s phone has as many rear cameras as the the other two combined. Believe it or not, it’s the Samsung Galaxy S8 that has probably the simplest camera – that’s until you think about the dual pixel autofocus which is still unmatched in the smartphone realm, and the Google Pixel-like multi-image processing brought in to enhance the otherwise last year’s shooter. The following specs should come in handy for a quick head-to-head but our compare tool is the real deal. As you can see, they have a lot in common, but there are also plenty of differences. Huge surprise there? Guess not. So, let’s get this show on the road. We’ll be back on the next page with a word on availability, price, and design.